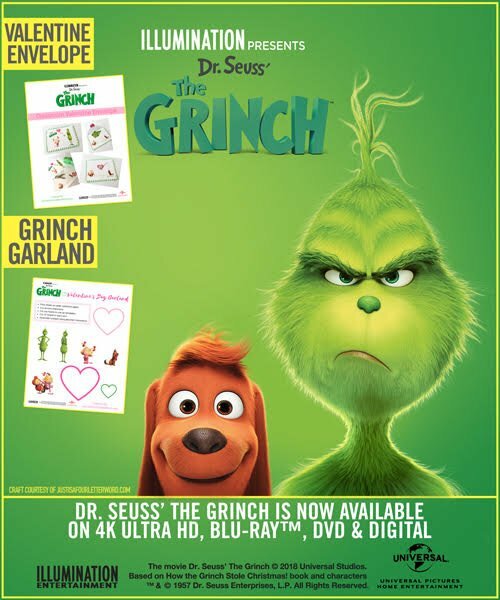 Dr. Suess’ THE GRINCH is now available on digital and Blu-Ray. I received a free copy to review, and all opinions are mine. Dr. Seuss’ THE GRINCH is based on Seuss’ beloved tale about a cynical grouch who goes on a mission to steal Christmas from others only to feel his own heart grow three sizes larger through unexpected friendships. It is one “the whole family can watch and enjoy,” (Kidsday/Newsday). Dr. Seuss’s The Grinch is a very cute family film. It stays very true to the original story; it just adds some embellishments! Those embellishments include beautiful animation and engaging characters. Cindy Lou Who gets a major upgrade, and she is the best! 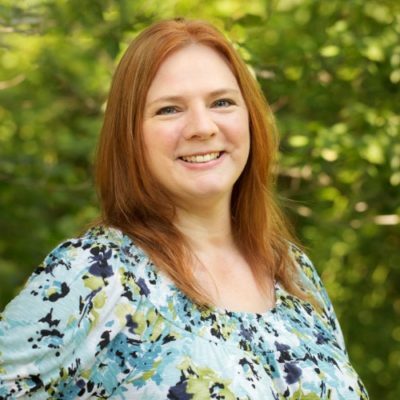 She’s inventive, friendly, assertive, and caring. Her friends, even though they play a minor role, add so much to the movie. The scenes they’re in are so funny! Mr. Bricklebaum (played by Kenan Thompson from Kenan & Kel and GOOD BURGER! and lots of other stuff) is hilarious! He’s probably my favorite character in The Grinch. I adore the animation! It’s so colorful and Christmasy! Whoville is filled with charming houses, and I really want to live in it. I’m all about Christmas. The story is made richer by the Grinch’s backstory as well as the added characters with their stories. I love Cindy Lou’s selfless wish for Christmas (I won’t spoil it for you), but make sure you watch the credits! You and your family will definitely enjoy this movie! 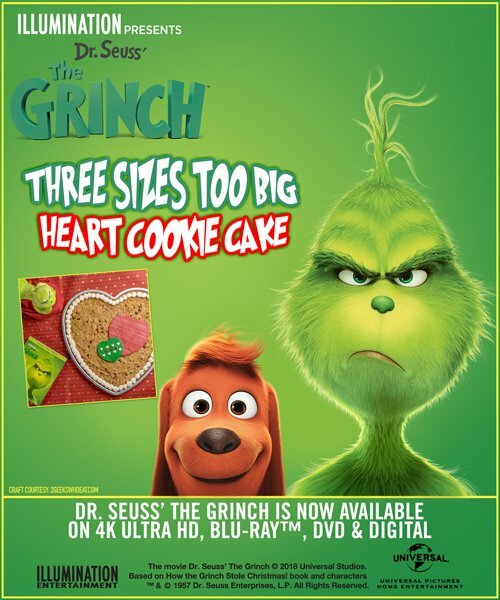 Make a Grinchy Cookie Cake for your Valentine! That would be so great! I’m glad he liked it! It’s adorable! You’ll really like it! We did see this in theaters! It was cute! You definitely need to! It’s very cute. My daughter and I went and saw the movie at the theater. She loved it and laughter alot during the movie. I prefer the Jim Carry version but my daughter likes this one because its nicer. Yes, this one is definitely aimed more to the calmer audience! I haven’t seen this yet, but I know it will be good because I’ve seen the original TV special numerous times and it’s always great fun! It’s very good and a lot like the TV special. I haven’t seen it yet but I will. I can’t wait! The previews on TV for this movie are so funny, I would love to watch this new and good movie with my whole family. Yes, the previews are great! I didn’t expect it to be so detailed. It was a nice surprise! I haven’t seen it yet, but I’ve seen some previews and it looks so cute! My girls have been asking to see it, so I know they would love it! It is adorable! They’d love it for sure! It’s really cute! They’ll like it a lot! I havent seen this version yet but would love to watch with the family. I love the old version. Thank you! It’s really good! I’m sure you’ll all like it! I haven’t seen it yet, but we love Benedict Cumberbatch. I do too! He’s great in everything he’s in! No I have not seen this movie yet. The movie is very similar in its story, and it’s very cute! 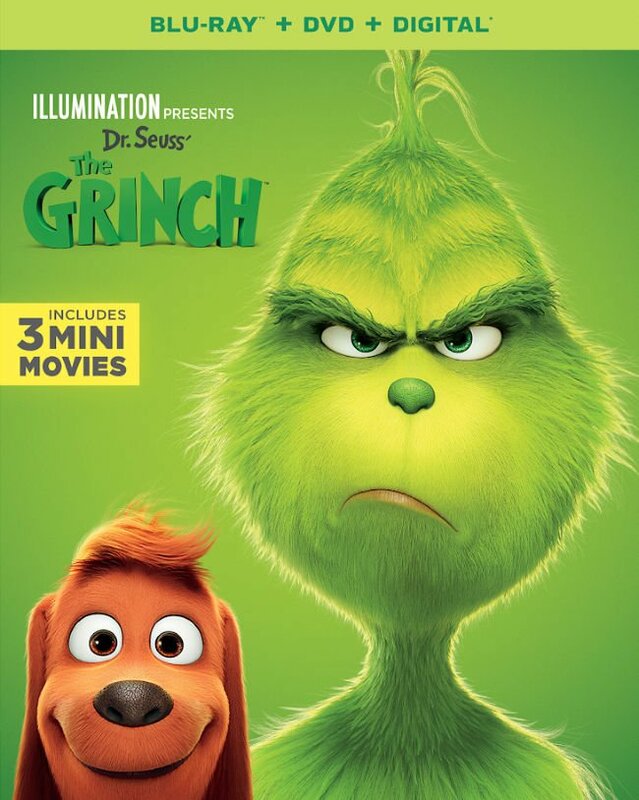 I have not seen this movie yet but I sure want to I love the Grinch. I love the original movie. If you like the original, you’ll really like this. It’s so cute. I haven’t seen this yet, but really want to. It’s so good! I’m sure you’ll enjoy it. I haven’t seen this yet but my daughter watches the original all the time! She’ll love this one! It’s so cute! I have not seen this movie at the show, but we have seen a lot of the Grinch’s TV specials. I love the TV special too! We haven’t seen this yet. We’ve seen the original TV special though. The kids watch it every year. It’s a great tradition to watch The Grinch on TV. This one is one you’ll want to add to that tradition! I’ve seen the tv special and the live action movie. I have not seen this movie yet but am looking forward to it. I like the story of the Grinch. I do too! It’s just such a cute story. No, I haven’t seen the new version of The Grinch yet. I’m planning to take my 2 grandkids to see it. It’s so cute! They’ll really enjoy it! I haven’t seen the original TV special yet. You need to see the original! It’s so good! I haven’t seen it yet, but I love Dr. Seuss, so I think we’d enjoy it. Thank you and God bless! It’s very cute, so I think you’ll like it! This one is just as good! We haven’t seen this new movie yet, but the original is a classic we enjoy every holiday. Thank you for the chance to win. It’s so good! You’ll really enjoy it! I have not seen this but I would love to watch it with my grandson. It’s very cute, so I’m sure he will enjoy it! I haven’t seen it yet. My kids have been wanting to see it. I saw the original when I was younger. I want this for my granddaughters to watch. The original is so good, and they’ll love this one too! I have not seen this yet but I want too. I love the original one. My favorite Holiday movie. It’s one of my favorites as well! You’ll really like the new one. I havent seen the movie yet but want to. I watch the original every year at Christmas time. I watch the original every Christmas too! The Grinch is a classic. This one fits it really well. I haven’t seen this one but I always loved the original. It’s very similar to the original with some embellishing! We haven’t seen this yet but, we want to. We love the old tv special. It’s so cute! I think you’ll really like it! I’ve always loved Grinch! My little family went to see it in theaters & we all loved it! Actually, I think it might be my favorite version yet! Even my husband who complains that I insist on watching the original every year enjoyed it! That’s great! It was so cute! I haven’t seen it yet. My daughter did and loved it. She keeps telling me I have to see it. She’s right! It’s a must see! I’ve never seen this movie yet!!! But am looking forward to seeing it!!! I love the original Grinch movie so I’m sure this one is going to be just as amazing!!! It is so cute! It’s very similar to the original. have not seen it, but love the original and The jim Carrey one so I am sure this will be a hit too. Yes, you need to see it! It is great! No we haven’t seen the new one yet! The original is part of our holiday season every year! It’s a great tradition! We watch it yearly too! I have seen The Grinch and we all really enjoyed it. I think that I’ve seen the original as well. That’s great! The Grinch really is a cute movie! I have seen the Grinch and it’s my favorite version! Thank you for the chance to win! You’re welcome! The Grinch is so cute! I have seen the original but not this newest one. Hoping to win for my kids. It’s very good! You need to see it for sure! I haven’t seen this yet. I did see the original one and the live action one and loved both of them. My littles would love to see this one!